I’ve spoken before on my use of LaTeX for my thesis. This allowed me to create a great looking thesis, with easy linking, cross referencing and bibliography that users of Microsoft Word struggle with! As plain text, this allowed me to edit my files on the Mac, Windows and iPad with ease - in fact, I write about my attempts to use the iPad only here, which includes me editing my thesis on the go on the iPad. However, I’m a fan of plain text files for all other writing as well - in fact, all my writing outside of work where I’m forced to use Microsoft Word, is done in plain text, in the form of Markdown. I think my workflow is fairly similar to most. As a Mac user, I’m spoilt for choice for Markdown editors, though as occasionally I use Windows at work, I’ve also come to realise that Markdown seems to be Mac and iOS user specific (or a number of Windows and Android users don’t want to program anything special). However, my basic writing starts in nValt as this allows me to search my notes folder. In fact, nValt seems to be slowly replacing Evernote for me, as I seem to be storing more and more data in plain text files, than in Evernote where formatting is kept etc - I’m finding I don’t need all of that. 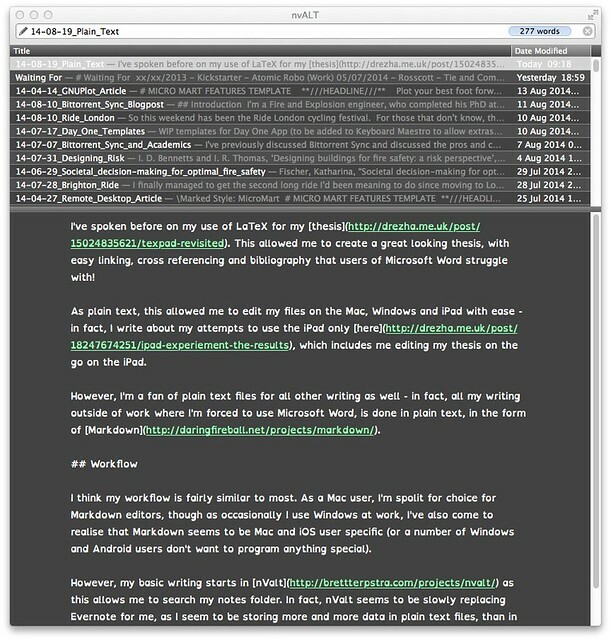 nValt is set to store all my notes in plain text within a folder in my ~/Documents folder. A few tweaks to the colour scheme and font (I use the Open Dyslexic font in nValt as for some reason it wont use the Mono Dyslexic font that I purchased a few years ago) mean that it makes for a relatively decent writing environment, with autosave and search should I need it. Seems that I’m mainly using it for writing articles and reports, rather than standard notes! With this setup, I’m able to sync my notes between my computers using Dropbox or Bittorrent Sync. I then use either Textastic or Editorial on the iPad/iPhone to edit the files (depending on what syncing method I’m using at the time). Editorial is better as any changes are automatically synced back to Dropbox but Textastic offers a few more options and offers syntax highlighting for LaTeX documents that I still occasionally use (yet to see a template for a letter written in Markdown). I don’t think I’d have been quite as successful at using Markdown if I didn’t have Marked (and now Marked 2). This lets me export my Markdown files into almost any other format. Pandoc does the same but it’s command line driven and not as easy to use. Marked 2 lets me export my files into .doc and .rtf files - which I need for writing for Micro Mart as they expect articles in Word compatible formats. Marked allows me to write wherever I am and then convert into almost any other format for sending wherever I need it to go. This means that the almost all of my writing can be replaced with plain text work as I can edit and use plain text wherever I am. The benefits of plain text writing is fairly straight forward. In addition to the points mentioned above, plain text files are small on disk space (smaller than Word documents) and can still be opened regardless of if you have the software installed (Notepad is on all Windows systems by default but Word costs money, unless you use the restricted online version). It helps that some of the other apps I use make use of Markdown - for example, Day One allows me to write in Markdown to format entries, which means I can make use of it to create tables and other information I might want to save.